Close collaboration between our educators, children and their families is vital in instilling strong and supportive learning. Sentia follows the Early Years Learning Framework (EYLF) from birth to 5 years and through the transition to school. The Framework is based on evidence that early childhood is a vital period in children’s learning and development and forms the foundation for quality teaching and learning with an emphasis on play-based learning to build a child’s communication and language (including early literacy and numeracy) and social, emotional and physical development. What we eat is an integral part of our day, not only as healthy nourishment, but as a way to learn more about the food, it’s sources, different cultures and the importance of connection and the conversations it brings. We come together for each meal to enjoy what our in-house chef has prepared for the day. Our menus are inspired by fresh, seasonal produce and vegies from our own patch! 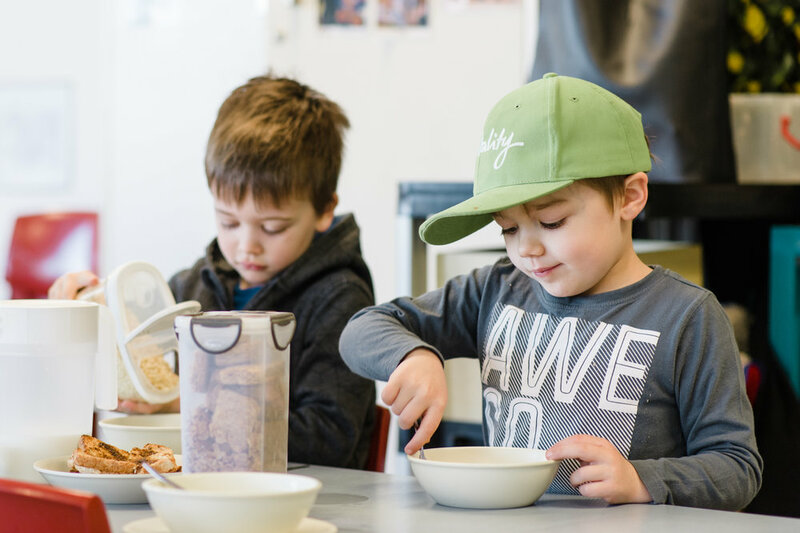 We often have the children help prepare the food, allowing them to explore ingredients, experience the joy of cooking and presenting a meal through to eating the delicious end-result. By introducing them to a world of delicious flavours and being involved in the process, it helps encourage children to try new foods. Our meals each day include breakfast, morning tea, lunch and afternoon tea. We are egg and nut free and we have meals that meet our children's dietary and cultural requirements. Our meals work on a 6 week cycle. View samples of our menus. We keep an open and inviting approach when it comes to sharing your child’s day with you. Our educators listen to the narrative of daily experiences which inspires us to understand the children as they engage and connect in activities. Conversations with parents help us understand more about your children and by opening up a dialogue with you, we work together. We communicate regularly with parents via email, children's portfolio, Facebook, one-on-one conversations and newsletters.